Did you know that one of the best spiritual practices you can do is to “work” with your energy centers on a daily basis? I am sure you are familiar with the seven major energy centers of the body, also called chakras. There are other smaller centers around the body and larger centers outside of the body. For our purposes we are going to focus on the seven major ones. Many of you are advanced in your studies and you may think this is too elementary for you. I think, however, that when you begin to practice this teaching, you will be amazed at what you experience and, therefore, learn. Today and on the coming three Fridays you will get a lesson from me. It is my gift to you and will cover the first four major chakras and how you work with them. We will cover the higher chakras in our upcoming course on Higher Energies. First, let me reassure you that “working with the chakras” is not difficult and will only take five to ten minutes of your time. This is why we start with one chakra at a time. You will do this work in meditation when you are connected to Spirit and in a calm and receptive space. One of the things that will happen when you begin to work with the chakras is you will develop your abilities to sense and feel the energies. This is soooo important. Each chakra has a different energy range, a different vibrational set of frequencies. With practice, you will be able to discern these and experience the differences between them. This becomes very advantageous when you reach the spiritual levels of frequency, as they are very rapid. It is our goal to be able to navigate these higher frequencies with ease and to maintain our conscious focus at these higher vibrations and, indeed, these higher states of consciousness. The seven major chakras are actually transmitters of energy. They each contain a gift from Spirit. You know that you are Spirit in manifested form. Accessing your vibrational frequencies at the different chakra levels allows you to access the different qualities, and attributes of Spirit. These actually are gifts and are given to us. We do not have to “earn” them. They are freely given. Allow 5 or 10 minutes for total concentration in meditation. If you need to set a timer, do, so you can be totally relaxed and centered on the exercise. By being totally focused you will be able to sense the very subtle energies. We want to experience these as much as we can. If you have a favorite way to move into a meditational state, use your own method. It is always a good idea to start any meditation with a clearing exercise. Here is one I like to use. It clears the physical body and consequently, the other subtle bodies as well. Visualize the Sun above your head and to your right. Then visualize the Moon above your head on the left. The Sun sends a ray of light to the Moon. Then they both send down beams of light that come together into one ray that is sent down into the top of your head. In other words, those three lines of light form a triangle over your head. Bring that light down into your head, down into your body and feel it roll through you like a wave, cleansing away all stress and tension, all mental anxiety and worry. Let it roll all the way down to your toes, into the Earth. The Earth will take that energy and mulch it into clean, renewable energy for the Universe. Use whatever technique works for you to move into meditation. If you don’t have one, simply follow your breath as you sit quietly, after the clearing described above, and notice a sense of peace and tranquility. Move into the present moment and notice that there is a Presence inside of you, breathing you, beating your heart. Now move your consciousness to the base chakra, which is at the bottom of the spine. The energy centers are about the size of a lime, although they do expand and contract. 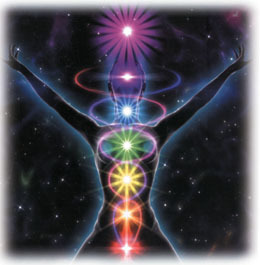 The rainbow colors are the most widely used system for the chakras and that is what we will use. Keep your attention focused on the base chakra. You can visualize the beautiful rosy red color of this energy ball. Notice what you are feeling. Observe. Move out with your inner senses and become aware of this energy. You may feel it pulsing. It has a vitality to it. It is the gateway of life energy for the physical body. Using just your intention, allow the maximum amount of energy to enter this chakra. Keep your focus and attention on that energy center at the base of the spine. Notice as the energy expands and opens. You may actually feel the energy boost in the physical body. Just observe. You may want to jot down your observations. This way you can see how you develop your abilities to experience the energy centers. Practice this short exercise every day. By Friday you will be proficient at beginning to sense energy in the centers. This will develop and your ability will expand as we proceed with the next step. This entry was posted in Dreama Vance, Metaphysics, Spiritual Growth on December 16, 2017 by Dreama.